What do we mean by biomes, vegetation types, floral kingdoms? - read on to find out..
What do we mean by vegetation? At its simplest, vegetation can be described as the group of plants forming the plant cover of a geographic area. As humans, we tend to classify things, and so vegetation has been classified too. This site provides some basic information on the topic. More information, plus GIS files can be downloaded from the SANBI BGIS website. Groupings called Biomes have been described based on dominant forms of plant life and prevailing climatic factors. Biomes have plants and/or animals living together with some degree of permanence, and one can observe large-size patterns in global plant cover. Biomes broadly correspond with climatic regions as moisture and temperature strongly influence plant establishment and survival, although other environmental controls are sometimes important. Each biome has a characteristic set of plant and animal species as well as a characteristic overall physiognomy. Physiognomy is used to interpret a person's character from facial features, so one can recognize a biome by its general appearance given by the shapes of the plants, and the landscape. The general plant characteristics give a distinctive appearance or visual signature that enables one to recognize the biome. For example, grasslands have mostly grass, deserts have much bare ground for most of the year but lots of annual plants following rain, forests have mostly tall trees with plants growing beneath the canopy at ground layer and at other levels. Mucina and Rutherford (2006) map nine biomes in South Africa: Fynbos Biome; Succulent Karoo Biome; Desert Biome; Nama-Karoo Biome; Grassland Biome; Savanna Biome; Albany Thicket Biome; Indian Ocean Coastal Belt; Forests; and two on the subantarctic Prince Edward Islands: Subantarctic Tundra Biome and Polar Desert Biome. See map below. However, the information we are providing on the biome pages of this site was taken mainly from an earlier publication by Low and Rebelo (1996). At a global scale the vegetation of the world is sometimes described in terms of six Floristic Regions, often called the Floral Kingdoms of the world. The distinction between regions is based on distinctive suites of flowering plants, taking into account those (particularly families) that are exclusive (endemic) to the region. 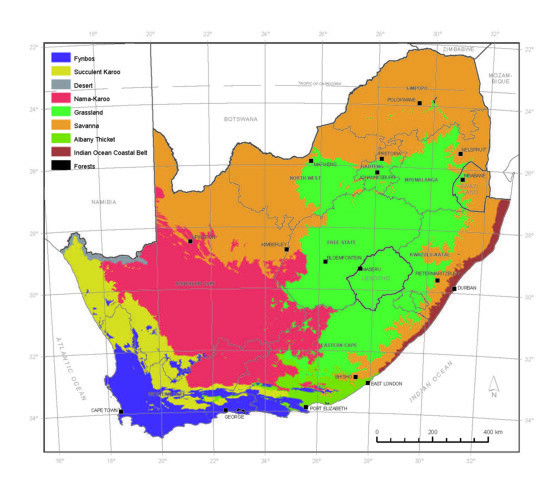 Of particular note to South Africans is that the Cape forms one of these distinct kingdoms; the Cape Floral Kingdom, covering 0.08% of the world's land surface, but containing about 3% of the world's plants. This is a precious resource to be proud of and to conserve for future generations. For more information about the Cape Floral Kingdom, see Fynbos Biome. The current published reference to South Africa's vegetation is the the book 'The Vegetation of South Africa, Lesotho and Swaziland. Strelitzia 19' by Mucina & Rutherford published in 2006 and information updated online. In 2006 there were 435 vegetation types described in South Africa, Lesotho and Swaziland, with 5 units mapped for the Prince Edward Islands. There are descriptions for each vegetation type in each Biome in the book. The descriptions include paragraphs that give details about how each vegetation type relates to previously published vegetation maps, distribution of the mapped vegetation, vegetation and landscape features, geology and soils, climate, lists of biogeographically important and endemic taxa, conservation, and remarks. A vegetation type is not as easy to recognize as a biome. The biome can be seen as the broad landscape and looks at dominant life forms and not at species. The vegetation type is defined in terms of dominant, common as well as rare species, as well as association with landscape features such as soil or geology, topography and climate. The book is accompanied by a large wall map. To find out more about the book and map and electronic versions to purchase, contact the SANBI bookshop.